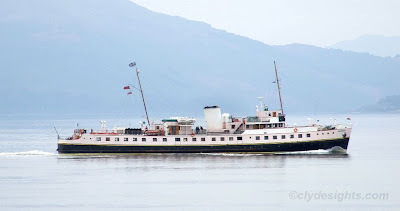 The preserved motorship BALMORAL, owned by the same company that operates the paddle steamer WAVERLEY, arrived back on the Clyde yesterday morning, and berthed at Largs pier. This afternoon she continued her journey to Glasgow, and was seen as she passed McInroy's Point on her way upriver. She is scheduled to perform a series of cruises over the September Holiday weekend, with sailings to Rothesay, Millport, and Lochranza on offer.